In June 1994, snooker fanatics Richard Balani and Joe Zammit and game complete-stranger, yours truly, teamed up and set up Snooker Promotions (Malta) with budding aspirations based on fervent enthusiasm of promoting and organising high level events. The baptism of fire, which gave SPM a modest introduction was the first Cisk Gold Malta Masters contested by the then four Maltese professional players. In October 1994 Snooker Promotions were back on the scene with yet another tournament which will definitely go down in the golden annals of the game in Malta - the first Rothmans Grand Prix. This tournament brought together five players from the top 16 on the world list. John Parrott won it yet Malta had more prestigious victories in store for him. The overall success of these first 'adventures' were instrumental to lure important attention both as a potential tournament venue and also on SPM's organisation competence. 1995 brought significant recognition to SPM's endeavours to organise events and prompt opportunities for local talent. 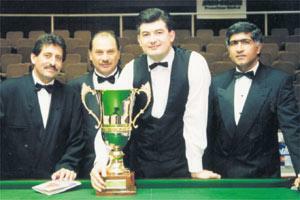 The first breakthrough was the recognition of the Cisk Gold Malta Masters '95 as a World Tour event. This gave our amateurs the chance to participate in tournaments alongside professionals. The splendour of the occasion went beyond the fact that seven Maltese joined nine overseas qualifiers in a 16-man tournament. The WPBSA, the game's world governing body, went further and entrusted SPM with the organisation of the final stages of a Tour Event. This was certainly an outstanding challenge, which undoubtedly put the organisers under proficient scrutinising eyes. The next notable development was the involvement of SPM in the organisation of regional qualifiers for no fewer than 10 World Tour events. Besides, this gave local players the opportunity to participate in the final stages of tournaments played elsewhere. The third major "cracker" of the year was quite rightly left for the 1995 Rothmans Grand Prix. The world body accepted to officially sanction this tournament which led to a very strong field of participants. Forming part of the line-up were Peter Ebdon, eventual winner, John Higgins, Darren Morgan, Ken Doherty, Nigel Bond, Dave Harold, Tony Drago and David Roe - eight from the world's Top 16. Another significant experience related to the 1995 Rothmans Grand Prix was the seminar for Maltese referees conducted by John Street, a retired professional Grade A official. Following Street's assessment, Michael Attard Montalto, Paul Galea and Victor Ellul were accepted as associate members of the Professional Referees Association. The Rothmans GP 1995 also presented the backdrop to the recording of a milestone for the relatively young history of SPM. Two days prior to the final, between Ebdon and Higgins, Snooker Promotions had the honour to associate itself with the WPBSA to announce the staging in Malta of the European Open in February 1996, the first ever world ranking event on our shores. The Rothmans GP retained its prerogative place on SPM's programme of events with successful editions in 1996 and 1997 won by Nigel Bond and Ken Doherty respectively. In May 1996 the third Cisk Lager Malta Masters was played in Marsascala. This tournament presented local enthusiasts with the opportunity of having two events in one - a 16-man snooker tournament, part of the '96 World Tour programme, and an eight-man invitation billiards tournament. For the first time, the European Open '96 gave a unique opportunity to local enthusiasts to see the top cueists in action here. Besides, it brought into the limelight the imposing facilities of the Mediterranean Conference Centre and the hospitality of our country. Yes, such an elite sports contest gave Malta an identity of quality, which was well reflected in over 15 hours of TV transmission on Eurosport, viewed in over 60,000,000 households' worldwide at the time. This first Malta-staged 'European' was also of great significance to Parrott who in beating Ebdon (9-7) clinched his third European title - the other two in 1989 and 1990. "We sincerely hope that the European Open is held here again. We will be doing our utmost to bring it back to Malta next year". This was the general comment of one and all at the end of the event. And so it was, for Malta was again favoured with the organisation of the 1997 European Open. Parrott, once again, made it to the final. But this time the Everton FC fan failed to make it against Higgins (9-5). In 1998 SPM presented the fifth Rothmans GP. It featured Higgins, Hendry, Doherty, Williams and the great Jimmy White. Hendry beat Doherty in the final. The year 2000 saw the sixth Rothmans Grand Prix which turned out to be the most prestigious of the series, as the WSA had endowed the event with its maximum recognition - a ranking tournament. The world's top 16 and 16 other qualifiers together with two local wild cards were in contest. That year Doherty beat Williams in the final, a victory that gave him a £50,000 award from a total prize fund of £295,000. 2001 was another superb year for Malta as a venue and SPM as organisers. This saw the seventh Rothmans Grand Prix and another prestigious edition of the European Open, a fourth world-ranking event for Malta in the space of five years. The main protagonist that year was Hendry. He won both events overpowering Williams in the Grand Prix final and Joe Perry in the Open's ultimate showdown. When referring to the 2001 European Open one cannot fail to mention that for the first time Maltese referees were chosen to control the final stages of a ranking tournament. Attard Montalto was in charge of the final and together with Galea and Terry Camilleri they had also proficiently handled all four quarter-finals and the two semi-finals. Last year, a unique scenario was created when The Continental Billiards and Snooker Association (CB&SA) entrusted the running of two prestigious events - the Continental Team Cup and the Ladies Plate - to the Malta Billiards & Snooker Association. In a spirit of co-operation, the MBSA and SPM decided to pool their efforts and jointly organise these two competitions along with the World Professional Billiards Championships, which brought together players from over 14 countries. This was another great incentive and opportunity for local referees. Throughout these years SPM have worked with a good number of reputed sponsors but one name in particular has been associated with practically all their events - Air Malta. The year 2004 is definitely of great significance to Snooker Promotions - 10 years since their first event and what better way to celebrate than by being entrusted with another world ranking event? The European Open, this year is marking its 12th edition. This will be the fourth European Open in a spell of eight years in Malta, a manifestation with a total prize-fund of £400,000 - £48,000 will go to the winner. Ten years ago the objectives behind the formation of SPM were outlined in the Foreword of the publication issued on the occasion of the first Rothmans Grand Prix in 1994. The proclaimed objectives were: "the desire to support local professional players by affording them international competitive matches even 'on home ground'; the satisfaction of being able to present local snooker enthusiasts with top level matches; and the ambition to put Malta on the professional international snooker circuit". That was stated ten years ago. This chronicle aligns the saying 'the proof of the pudding is in the eating'. Yes, although life is fast going and occasionally chaotic, I am glad to have stopped to reflect on these memorable memoirs. As one of the original SPM trio in 1994, who unfortunately had to give up my active involvement, I wish the present directors, Richard, Joe, Lawrence and my son Ramon, a very special 10th anniversary and many more years of top-notch snooker for Malta. The 2004 European Open gets underway tomorrow week at the Hilton Malta. So far, organisers have reported a steady sale of block tickets. Day and session tickets go on sale tomorrow from the Hilton. One may obtain more details by phoning 7914-7147.